Right-hand drive 1975 Carrera 2.7 MFI Targa in Guards Red and chrome trim will be offered at the Silverstone "Porsche Sale" in May 2017. Complex 'Homologation' regulations required that in order to ensure cars built to compete in 'production car' racing on the world stage were not 'one-off' specials, they had to be produced in sufficient quantity and to an agreed form and, in the case of the Porsche 911 Carrera, that was the lightweight, racing 'RS' specification. 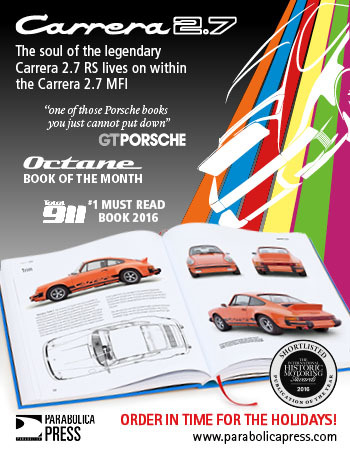 Customers wishing to purchase a Carrera RS for the road had to specify the 'Touring' package that cost an extra DM 2,500 and offered the greater comfort of the 911S' trimmed and upholstered interior. 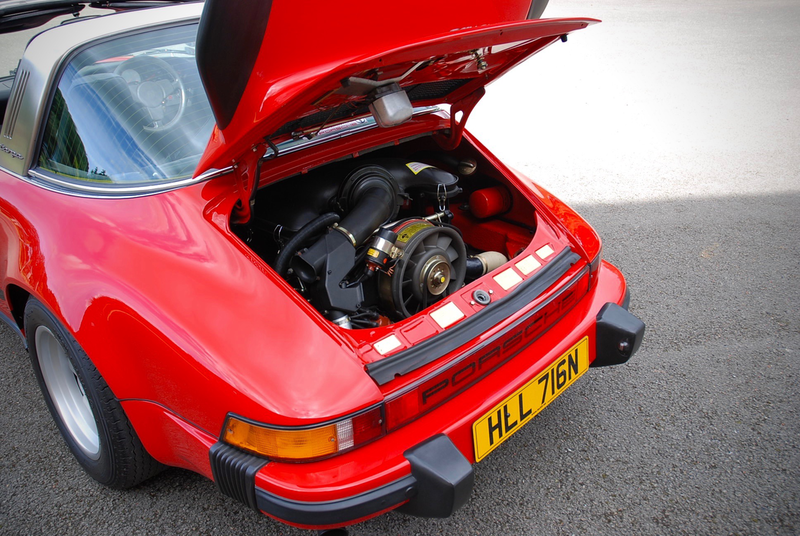 When those production targets had been met, the lightweight RS was discontinued but the Carrera name remained proudly on Porsche's top-of-the-range model, which in its new, series-production 911SC form mounted the 210bhp engine in a full-weight, fully trimmed body shell. 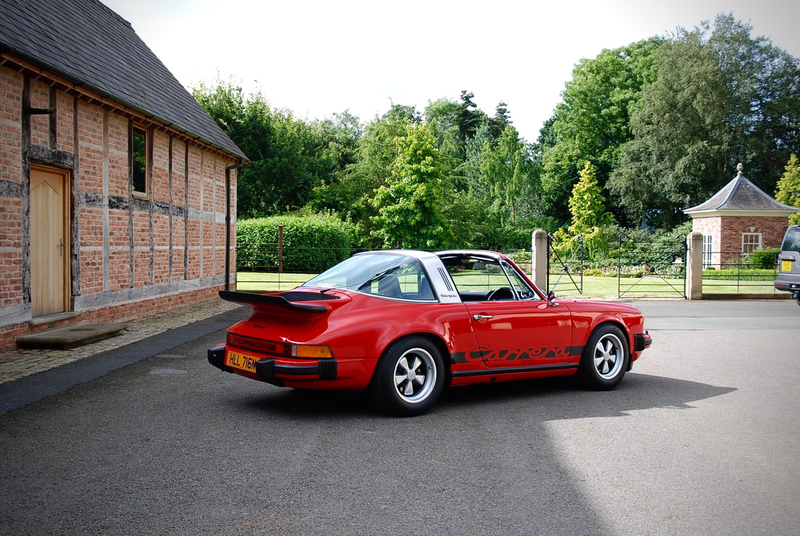 In 1975, if you wanted to order a Porsche 911 Targa, then the 210bhp Carrera version was the absolute 'top of the range'. A rare right-hand drive Carrera Targa - one of only six supplied to the UK - this car was first registered in February 1975 and delivered with a fairly comprehensive complement of factory options. 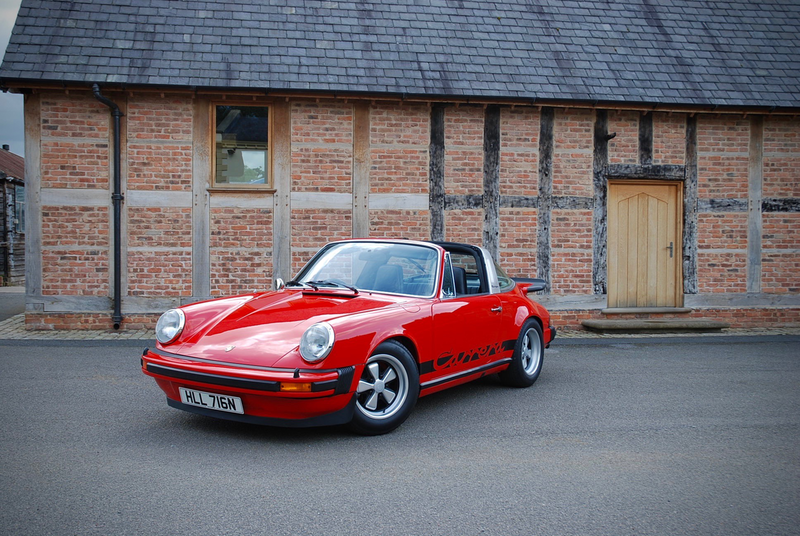 Finished in classic Guards Red with black leather seats (inlays perforated), it came with headlamp washers; 15" Fuchs alloy wheels; driver's side outside mirror; rear wiper; front and rear spoilers; tinted windows; intermittent wiper control; chrome trim parts; Bilstein shock absorbers; and 'Carrera' lettering in black. Previously owned by Porsche enthusiasts and Porsche Club GB members, this car has been cherished throughout its life and retains many important period details, as listed in the factory delivery specification. 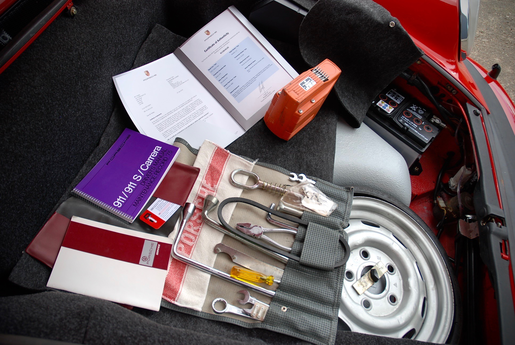 It has covered some 125,000 miles from new, which is fully documented and comes with an extensive service history and MoT records dating back to the early 1980s. 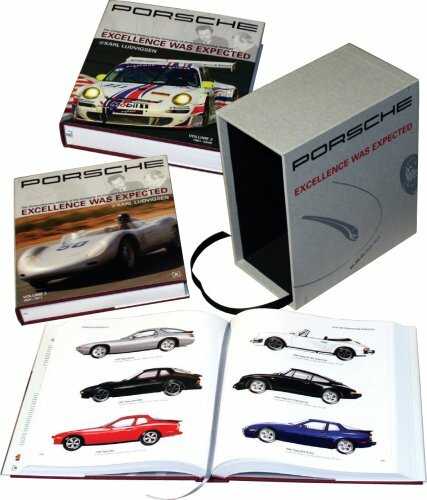 The accompanying Porsche Certificate of Authenticity confirms matching engine and gearbox numbers. The engine has been rebuilt and is nicely detailed. It benefits from a new stainless steel exhaust system, mated to an original Bischoff final silencer that has been ceramic coated for cosmetic durability. The intake system is all original; the throttle bodies carry the date stamping, and the MFI fuel pump is of the correct date and type (019) as originally delivered. We are advised that the original Type 915 gearbox is very good mechanically. The wheels are believed original and carry the correct date stamp '74', and they have been professionally refurbished in the correct, 1974-specification 'petal' finish and shod with a set of period-looking Avon CR6ZZ tyres. 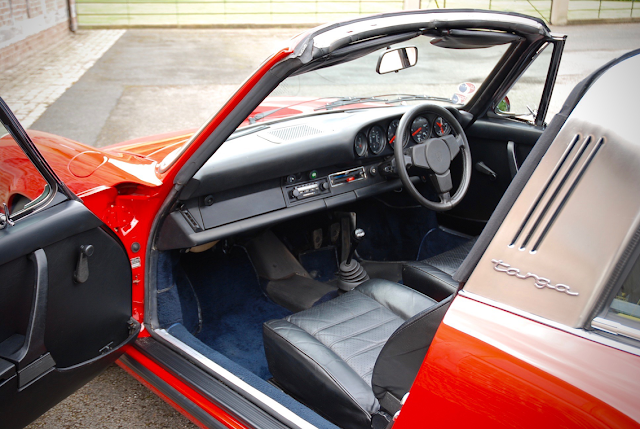 The interior is remarkably well-preserved with the original vinyl dashboard and trim panels where they have always been and the special optional leather seats remain in wonderful condition, complimented by the original blue/black leatherette of the rear seats. 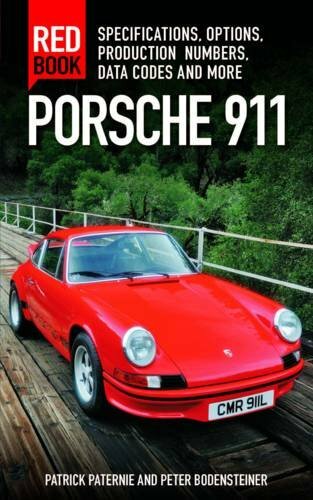 The combination of Guards Red with chrome window trims and stainless steel roll-hoop is a rare find for this model year as, by 1975, most cars were delivered with black trim, making this combination particularly unusual. 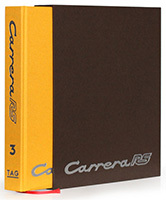 The Carrera comes complete with its 1975 driver's manual and service directory booklet in the original documents folder. 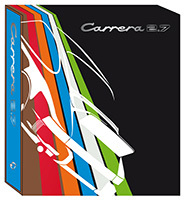 A complete tool kit with jack and period-correct air compressor is included in the sale. 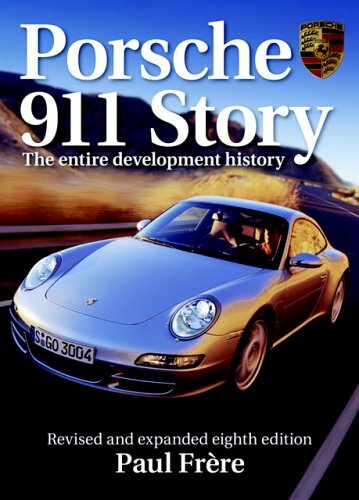 Accompanying paperwork consists of sundry restoration invoices, MoT to June 2017, a V5C Registration Certificate, and the aforementioned Porsche documentation. 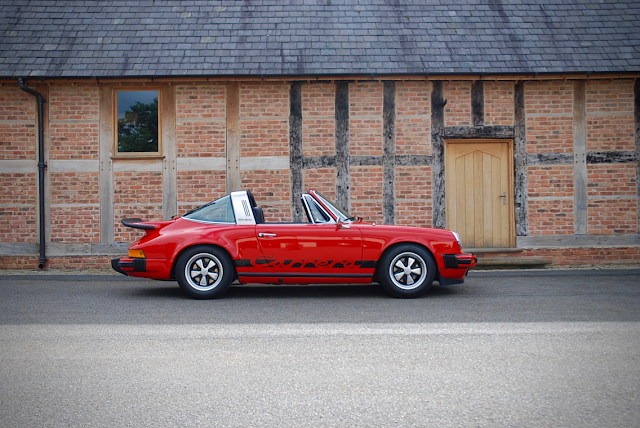 This is one of the best examples of the 2.7 Litre Carrera Targa we have ever seen. 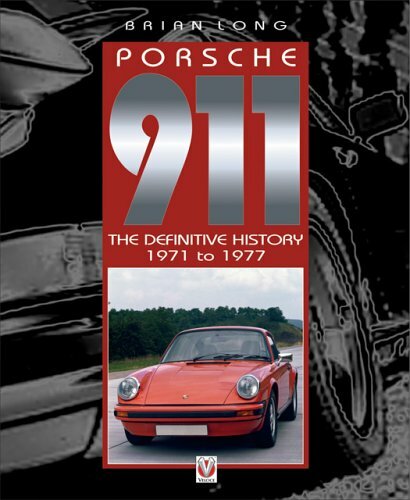 These cars are very collectable and extremely rare, particularly in such splendid condition, and this exceptional 911 Carrera is ready to be enjoyed by a new custodian.